Judah focuses his practice in bankruptcy law and bankruptcy related litigation, representing debtors and creditors in all aspects of Chapter 7, Chapter 11 and Chapter 13 cases and trustees in Chapter 7 cases. He is admitted to practice law in the State Courts of New Jersey and the United States District Court for the District of New Jersey. Judah earned his undergraduate degree at Rutgers University, and his Juris Doctor degree at the Rutgers University School of Law. While at Rutgers Law School, Judah was an active member in various pro bono programs. These included Street Law, in which he taught a basic law literacy class in a Camden elementary school, and coaching the mock trial team for Camden high school students. Judah also completed a Marshall Brennan Fellowship which involved teaching basic law and constitutional literacy to Camden high school students. 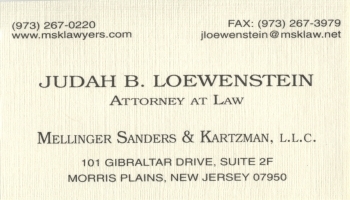 Following law school, Judah served as the Law Clerk for the Honorable Stephen J. Bernstein, J.S.C. in the Essex County Superior Court, Family Division. Judah has experience in family law matters, civil litigation, commercial litigation, and real estate matters.